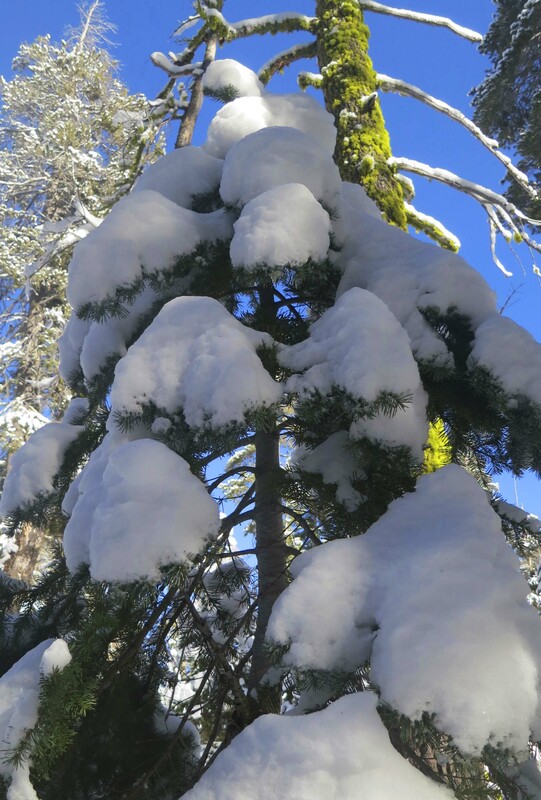 Fresh snow decorates a tree on Donner Summit, Interstate 80’s pass over the Sierra Nevada Mountain Range of California. 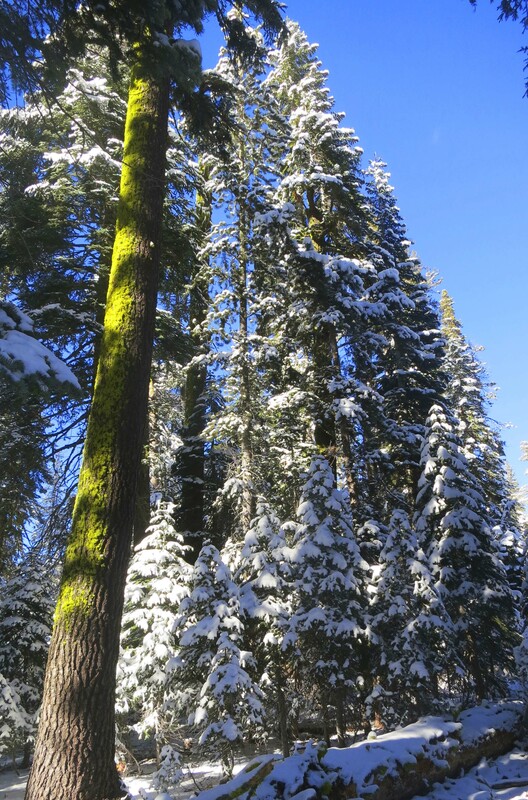 Fresh snow had just fallen and the draught-stricken forests of the Sierra Nevada mountain range were breathing a momentary sigh of relief. A few inches decorated the ground and trees. Peggy and I stopped at Donner Summit on our way between Reno and Sacramento on Interstate 80 last week to enjoy the view. 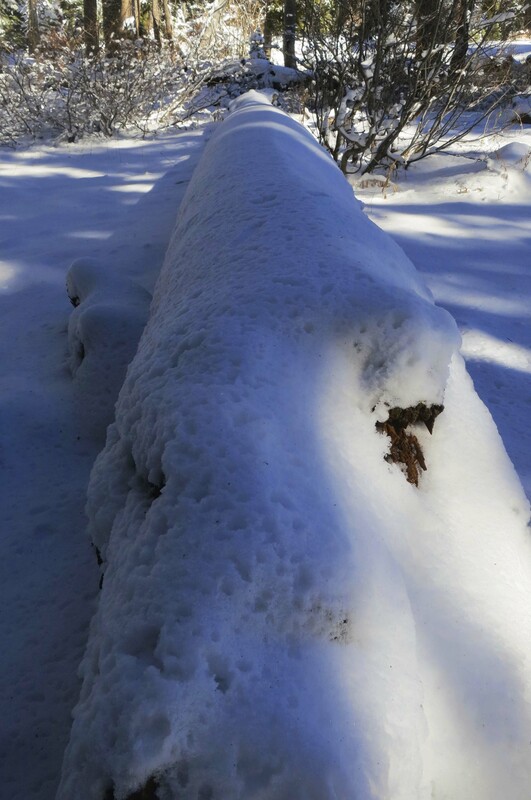 Normally this area is covered in white stuff; the annual snowfall is over 400 inches. It can be dangerous as well as beautiful. 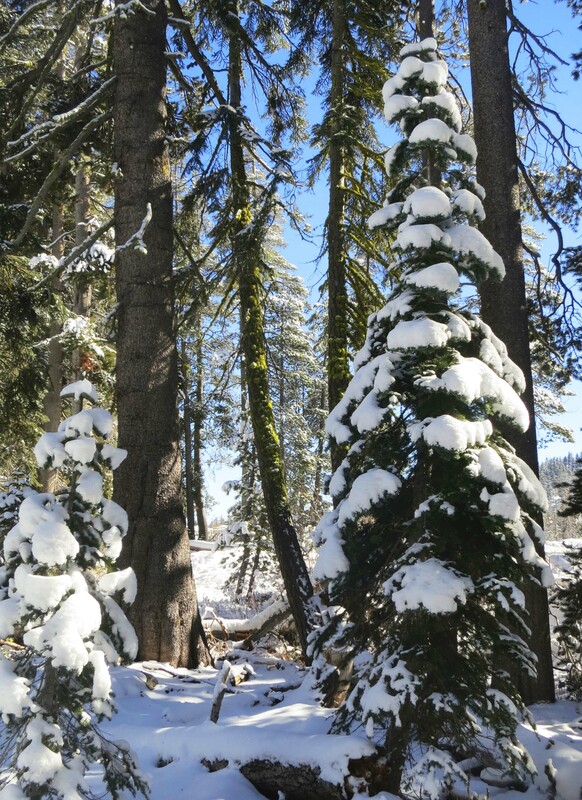 The ill-fated Donner Party learned this the hard way in the winter of 1846-47. They arrived a tad too late in the year on their way to California and were caught in an early snowstorm. Unable to get over the pass, they built cabins at its base to wait out the winter. When their food ran out, they started eating each other. 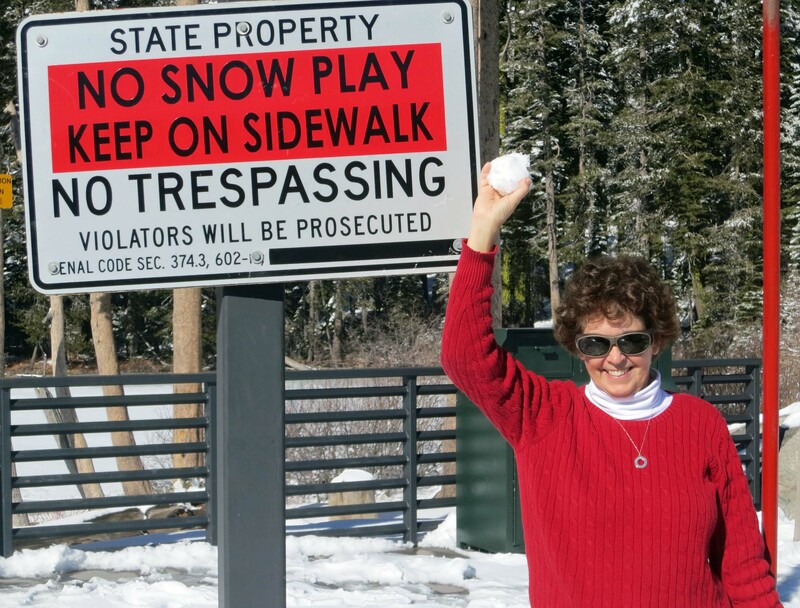 There’s a marker at the site– it is now a state park– that shows how deep the snow was. I used to camp bike treks at the park and would always announce the first evening’s meal as mystery-meat stew. I know, I know, bad taste, so to speak. 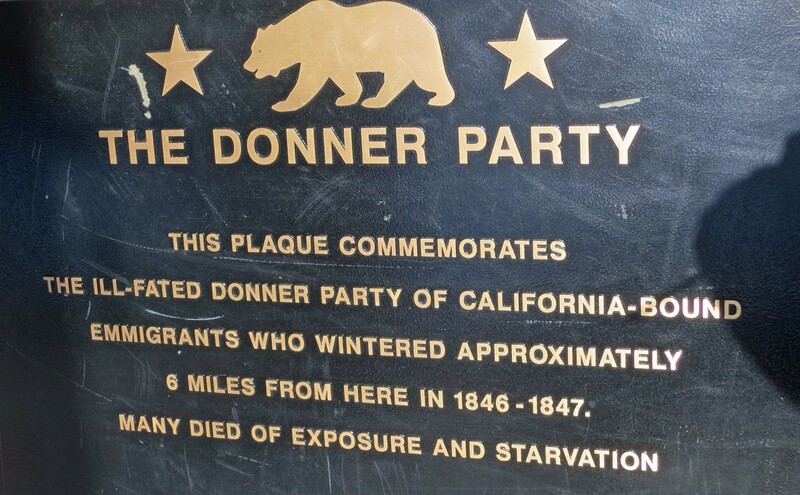 Donner Party plaque at Donner Summit, 6 miles from where the Donner Party met their unhappy and tragic fate. I am quite familiar with how deep the snow can get. A friend owned a cabin at Serene Lakes near the summit. (Serene Lakes were known as Ice Lakes before a land speculator showed up.) I was there a fair amount of time in the late 70s and early 80s. It was a two-story cabin and the second story door became our entry way during the winter. One year, the cabin actually disappeared under the snow. I spent my time shoveling a few tons off the roof. Whenever snow was predicted, we would put bamboo poles at the front, back and side of our car. Vehicles could be buried overnight. The poles were there so the big road-clearing, snow-eating machines would see where the car was before consuming it. Crunch. We saw a car that had met that fate. It wasn’t pretty. 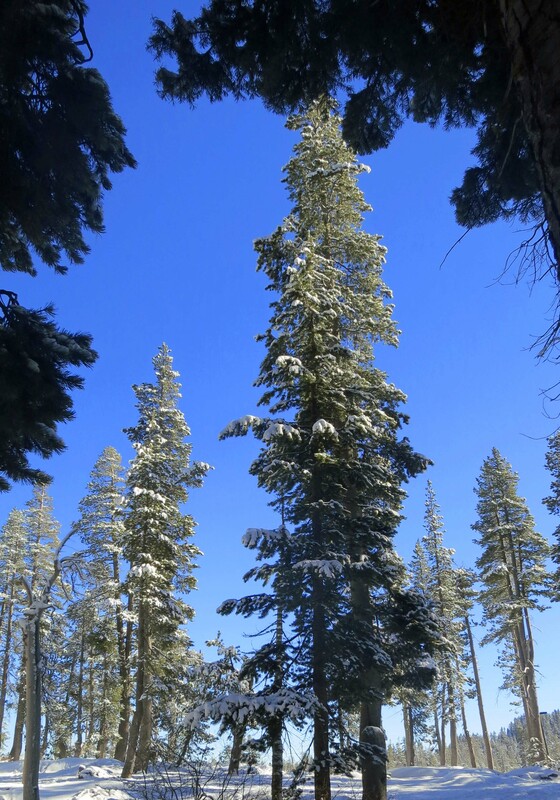 Once, when I was planning a seven-day winter camping trek through the Desolation Wilderness, I decided to do an overnight training out of the cabin. I recruited a pair of winter backcountry experts, Paul and Diana Osterhue, to help. Paul and Diana had us cross-country ski a few miles from the cabin and build emergency shelters to sleep in. Most of my fellow trekkers opted for snow caves, but I went for a trench. A snow trench looks a bit like a grave. In fact it looks a lot like a grave, but it is quick and easy to build. This is quite important when bad weather and hypothermia are threatening. I dug mine three feet deep by two feet wide and put my closed-cell foam sleeping-pad and sleeping bag on the bottom. Next I covered the trench with my skis and a poncho. My backpack served as the door. It was quite cozy, assuming you didn’t have claustrophobia or mind sleeping in a grave. I slept toasty warm all night but was concerned when I woke up in the morning and found my tough cross-country skis sagging in the middle. It had snowed in the night and I was buried under the snow! I pushed at my backpack. It refused to move. Did I panic? Heck no. I kicked the backpack with all of the strength of Arnold Schwarzenegger on steroids topped off with a mega-dose of adrenaline– when he was 20. Grudgingly, the pack gave way. I wormed my way out from under three feet of the new snow, creating a gopher-like pile of the fluffy stuff. I was met by a white wilderness. No one was to be seen. Curt was alone in a silent world. So I yelled, loudly, and was met by muffled responses. I didn’t move because I wasn’t sure where all the bodies were buried. A few seconds later, the first head popped up out of the snow, and then another and another. Soon, we were all accounted for and okay. It was a grand adventure. The type I love. The only thing left to report on our trip was that it was tough skiing back to the cabin. If you have ever cross-country skied in mountainous terrain through three feet of fresh powder, you’ll know what I am talking about. We took turns breaking trail. I couldn’t have asked for a better training experience for my fellow trekkers– or me. Blue skies, sunshine, and bright green moss added to the beauty. NEXT BLOG: We return home to be greeted by our next door neighbor and his proud announcement of having baby goats. I am surprised he didn’t offer us a cigar. 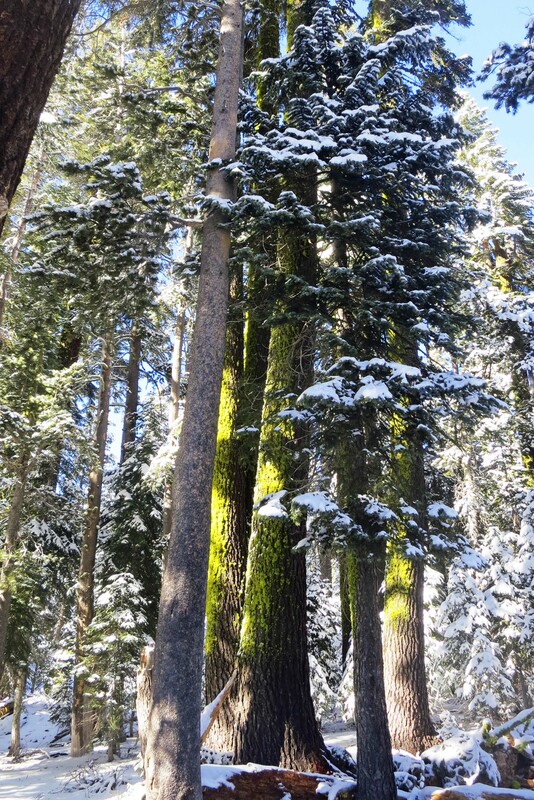 I’ll close this blog with a final photo of Sierra snow. 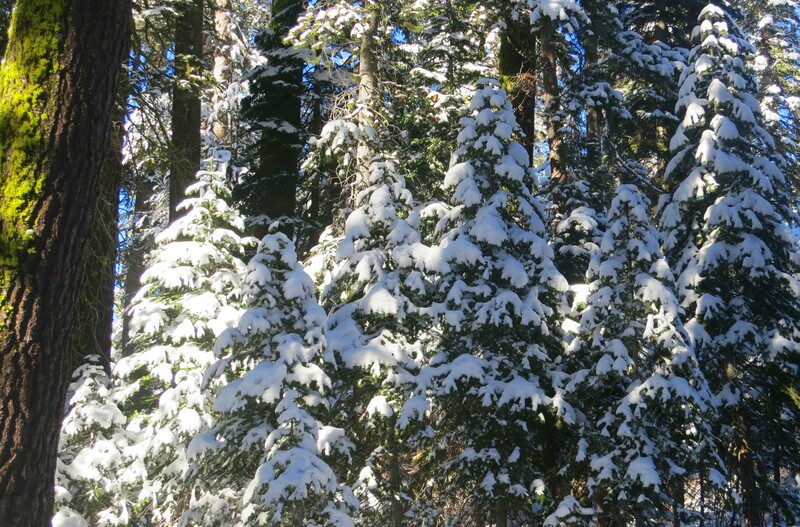 Properly attired, I could have wandered for hours (and have) among theses snow-covered woods.